1. Units, Partition Panels* — Min 2 in. thick, 24 in. wide insulated steel panels installed vertically. 2. Gypsum Board* — Any 5/8 in. thick UL Classified Gypsum Board that is eligible for use in Design Nos. L501, G512 or U305. For 1 hr. — two layers, 4 ft. wide, applied vertically and attached directly to metal skin of panels. First layer installed vertically and secured to building units with 1-5/8 in. long #6 self-tapping drywall screws spaced vertically 24 in. OC and horizontally every 24 in. OC. Screws fastened into metal skin of building units through the gypsum board. Second layer positioned vertically so that the joints offset the first layer by 24 in. Second layer secured with 1-5/8 in. long #6 self-tapping drywall screws vertically spaced 24 in. OC and horizontally every 24 in. OC. Screws fastened to metal skin through both layers of gypsum board. Joints in the second layer taped and covered with joint compound. For 2 hr. - Third layer of gypsum board positioned vertically so that the joints offset the second layer by 24 in. Third layer secured with 2-3/8 in. long # 6 self-tapping drywall screws vertically spaced 12 in. OC and horizontally every 24 in. Fourth layer positioned vertically so that joints offset third layer by 24 in. Fourth layer secured with 3 in. long #6 self-tapping drywall screws vertically spaced 12 in. OC and horizontally every 24 in. First vertical line of screws in fourth layer offset approximately 4 in. from previous layer. Joints and screw heads taped and covered with joint compound. When item 3 is used, Gypsum board secured to steel with same screw size and spacing as above. For 1 hr. - 2 layers. For 2 hr. - 4 layers. 2A. Gypsum Board* — (As an alternate to Item 2) — Nominal 5/8 in. thick, 4 ft wide panels, secured as described in Item 2. 2B. 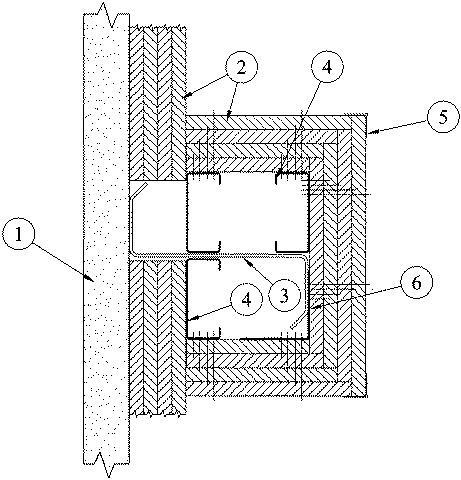 Wall and Partition Facings and Accessories* — (As an alternate to Items 2 and 2A) — Composite Gypsum Panel — Nominal 5/8 in. thick, 4 ft wide panels, secured as described in Item 2. 3. 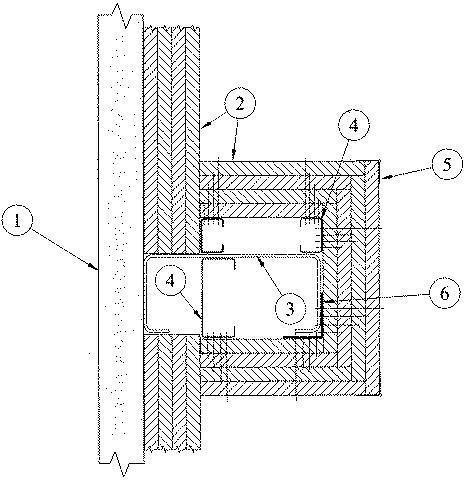 Steel Girt — Optional - Z or C shaped cold or hot formed members min. 2.8 lb per foot, 16 gauge, and 8 in. deep. Secured to metal panel with 14 ga. galvanized steel reinforcing clips, attached to steel girt with 1/4" - 14 Hex Head Self-drilling screws. 4. Steel Stud — When item 3 is used. Min. 1-5/8 in. deep with min. 1-5/16 in. legs and 1/4 in. folded flange, fabricated from No. 25 MSG galv. steel. 5. Corner Beads — When Item 3 is used. No. 28 MSG galv steel, 1-1/2 legs to be attached to gypsum board with No. 6 x 1 in. screws spaced 12 in. OC. 6. Steel Angle — When Item 3 is used. Min. 1-5/8 by 1-5/8 in. legs when used with C shaped cold rolled members, Min. 2-1/2 in. legs when used with Z shaped cold rolled members, both fabricated from no. 25 MSG galv steel. 7. Finishing System — Not Shown — When Item 3 is used. Joint compound applied over corner beads and exposed joints and screw heads to a thickness of 1/16 in.